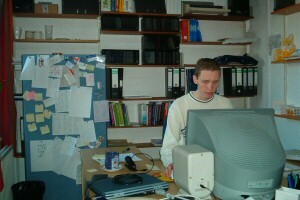 This picture shows me in my office at the University of Kent where I did my PhD till 2006. The main purpose of this website, really, is to provide webspace for things that might be useful for others. What you won't find here is a 'personal' homepage that tells people I don't know things about me they are not interested in. Those who know me know these things anyway, and others don't care. So, why waste time to build a 'personal' homepage? To navigate through this website, simply use the links on the left in the [full] version. If you have any comments or suggestions, please don't hesitate to e-mail me at info@informatico.de.